It is just before Christmas in 1994 and after a lot of family discussion resulting in the eventual expenditure of £599, weighing up carefully all the pros and cons of such a purchase, Santa Claus finally delivered an Acorn Archimedes A3010. This was in essence my very first personal computer, with 1MB memory, a 32bit RISC OS 3 operating system and crucially an internal floppy disk drive. Well today the specifications aren’t going to blow you away so I can forgive you for not feeling the same sense of glee and a lack of understanding at my persistence of waking my parents up at 4am to open my presents, however it opened the doorway into a new genre of gaming I had previously missed. Point and click adventures back then and even now have a very special place in my heart and although there was a serious lull in releases a few years ago when many believed the genre extinct, the advent of the Nintendo Wii, the Apple iPhone/iPod touch and online services such as Xbox Live Arcade and the PlayStation Store, these games are re-appearing in both their original form, remastered and even brand spanking new ones carrying on the legacy. Like many other point and click adventure games, you guide a character through individual backdrops and by walking to the edge of the screen, another background will appear and this is where the exploration begins. You are not just aimlessly wandering around admiring the scenery, instead collecting items to place in your inventory, chatting with the various bizarre folk who inhabit the landscape and completing certain tasks that require a little logical and sometimes not so logical puzzle solving will fulfil your adventure yearnings. 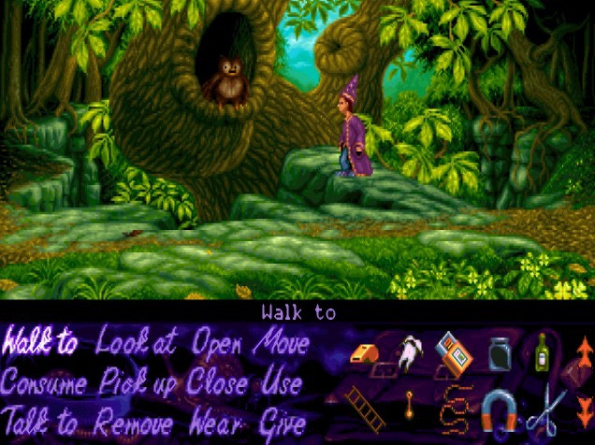 At a time when Monkey Island and the lead hero Guybrush Threepwood dominated the scene, Simon the Sorcerer came along offering an alternative, featuring a world overflowing with comical parodies of fairy tales and even references to The Lord of the Rings. Simon is a typical disgruntled teenager who thanks to his small dog Chippy, discovers a chest in his attic. Inside the chest is a spell book, which Simon chucks to the floor revealing a magical portal. Chippy disappears through the glowing entrance and Simon follows with haste. On the other side, Simon appears fully dressed in purple and gold wizard attire, complete with a magical hat that will act as his inventory. Looking around Calypso’s cottage, our young student of mystical forces locates a note especially written for him on the desk. In this the story is revealed, detailing your quest to become a wizard that will hopefully result in you defeating the evil sorcerer Sordid. Sounds simple enough, but along the way you will be facing a red fire breathing dragon with a darn right nasty cold, mining dwarves who have no time for people without kegs of beer, a talking tree stump with resident woodworm who easily take offence and a swampling whose Swamp Stew will leave you vomiting for more (yes you did read that correctly!). Although the scenery can look quite pixelated on modern hardware, thankfully with the ScummVM software, you can enhance the graphics removing many of the issues on higher resolution monitors. What is revealed is a lovely hand drawn collection of backdrops as you trample through forests, dungeons, taverns, villages and other such wonderful locations that stand out, brimming with vibrant colours and eye candy. It is not just the scenery that appeals to your now stimulated senses though, as your funny bone will be tickled more often than not at the sarcastic and belittling humour offered by Simon and his various encounters. Although he can be a fairly sensitive fourteen year old when it comes down to removing thorns, within a little discussion you will have the opportunity to decide how devilish your replies are and the remarks are often sublime in execution. They do not impact the games progression or final outcome, but you will have a lot of fun pushing your conversations to the limit, although flirting with women really isn’t his forte. I first owned Simon the Sorcerer on a set of floppy disks which meant any dialogue within the game appeared as subtitles. Before I purchased a new 486 PC I noticed Simon the Sorcerer on PC CD-ROM for £14.99 and I couldn’t resist. In this version, the extra capacity of the media was used for the recorded dialogue, with Simon voiced by Red Dwarf and The Brittas Empire actor Chris Barrie. Can you imagine my excitement when Simon and all the other characters began speaking audibly through my speakers and all the voices that once only existed in my imagination, were now realised. If anything, Simon felt even more rebellious than usual. My admiration for Simon the Sorcerer doesn’t stop there though… A few years ago I started work on enhancing the original MIDI music that came with the PC version of the game. Remaining as faithful to the included music as possible, with permission from Simon Woodruffe of Adventure Soft and assistance from the ScummVM team, in 2007 I released the complete soundtrack for use within the game under the ScummVM Music Enhancement Project. Simon the Sorcerer is just a stunning embodiment of point and click adventure gaming and although it was my first real experience of the genre, which may lead to a little bit of biased nostalgia on my part, I would find it difficult for anyone not to appreciate this masterpiece. Although the sequel to Simon the Sorcerer offered a lot of entertainment value, for me the exploration of the first is the key element that catapults the original into another league of excellence. The vocal talent, the landscapes and the music all add to the fantastical nature of this title, which is something often missing from a lot of today’s so called adventures. iPhone Conquering Portable Gaming – My Sony PSP and Nintendo DS Slowly Collecting Dust!